I love the Alexa… and I’m an editor. It’s no secret that Arri cameras have become the standard of high-end productions across the film and television industry. Arri’s ability to produce such a high-end image, in terms of color latitude and dynamic range have secured Alexa’s dominance as the workhorse for Hollywood’s elite cinematographers for digital filmmaking. On the post side, we usually don’t have any control over what camera package is chosen for a project, or how that footage makes its way to us. But of all the cameras and codecs that we see on a daily basis, Arri footage is loved in post-production just as much as it is on set. All high-end cameras these days make an incredible image, but I really appreciate anything that makes my workflow faster and more efficient. Arri’s ProRes and ArriRaw workflows in post are fast and straightforward, and that’s why I love the Alexa. I want to share with you some Alexa and Arri workflow tips I’ve acquired over the years working on commercials, features and TV shows. Most of these tips are written for Adobe Premiere Pro, but you’ll find much of the information will transfer to other NLEs if you know how to do the equivalent action. Consumer digital cameras are generally set up to shoot in a standard color profile called REC709. Pro-level cameras also capture their footage in log, a flat color profile that retains the full range of the camera’s sensor within each clip. Footage shot in log will usually deliver a much wider dynamic range and give us much more control over an image than what REC709 can provide. Every camera manufacturer has their own type of log color profile, tuned to the hardware in their different cameras. On an Arri camera, choosing Arri’s Log C color space will utilize the full range of Arri’s powerful sensor. Arri cameras have the fantastic ability to shoot directly to ProRes. Specifically, ProRes 422 HQ and ProRes 4444 are the most common codecs I will get back from an Alexa shoot. These versions of ProRes are built for finishing, and ProRes is usually a very smooth codec for an NLE to handle—so getting footage in, organized and starting to edit is really quite simple. Just like bringing in any media in Premiere, either navigate to the footage in your media browser or right-click in the project window and click “import.” Once your footage is imported, I’d recommend making proxies of all the media to speed up your workflow. Premiere makes it super easy to toggle back and forth if your proxies and full-res media are both connected. You can read a full article on Premiere proxy workflows here. Premiere has the ability to create Proxies for you based on encode presets you create through Media Encoder, but if you are working with a range of aspect ratios within a single project, Premiere ends up being a bit of a pain in creating the proxies. You’d have to create presets for each aspect ratio and that can become time-consuming, and again, all about efficiency over here. Instead, I like to use a third party app like Edit Ready from Divergent Media for creating proxy media from Alexa footage. Edit Ready will match the aspect ratio and resolution settings, and can output a ProRes Proxy file, without having to create and ingest and encode preset within Media Encoder. Edit Ready will interpret the file in the same way that Finder does. This way you’ll have a proxy at the same resolution and aspect ratio as the original clip, just with a smaller sized codec. This is extremely helpful in creating proxies for anamorphic footage, which comes in squeezed, and we have to tell Premiere to interpret that footage differently. By default, Premiere doesn’t have an anamorphic aspect ratio encode preset that will match the resolution and match the way finder interprets the squeezed file. I’ve had this problem several times, and it simply just slows me down having to create custom presets for different aspect ratios, especially if I’m working on different editing machines and don’t always have my presets available. I’ve found it to be faster to let something like Edit Ready just do the work. I’ll let it run in the background while I’m editing, then I simply Attach Proxies to the media within Premiere when it’s done. To de-squeeze anamorphic footage in Premiere, highlight the clips in question, right click and hover to modify and click on interpret footage. Once there, under Pixel Aspect Ratio click the Conform to: toggle and select Anamorphic 2:1 in the dropdown menu. Premiere will then interpret that footage moving forward as anamorphic and it will be de-squeezed. You can do this for all of your footage at once if you have it all imported. Alexa and Amira cameras that are shooting in Log C can also hold an embedded LUT within each clip, such as an industry standard REC709 LUT or a custom look created by the cinematographer. These LUTs live at the source level of each clip and arrive embedded within the clip automatically (assuming the cameras were set up that way from production). This is super helpful in the edit to immediately have a REC709 look on the footage without doing anything extra on our end to tell Premiere to apply the LUT. Cinematographers and DITs can also create custom looks that will be embedded onto the footage to make sure you’re seeing what they were seeing on set. The embedded LUTs can easily be toggled on and off when needed within Premiere. To find the embedded LUT, load a clip into the source menu from the project window and click Effect Controls. You can also load a clip directly from a sequence, but you’ll have to then toggle to the master version to see the original version of the clip, as opposed to just that instance of the clip in the sequence. You will see that Lumetri Color has been added and is carrying the Amira LUT. You can toggle this on and off for this clip, and for any time this clip is being used, by clicking the fx button. Any of the Lumetri Color parameters can be adjusted from here as well. Some higher budget productions will choose to shoot in ArriRaw. This is an uncompressed, unaltered raw codec that holds a ton of information while taking up a ton of space. Usually, productions will shoot ArriRaw if they are wanting to keep as much image information as possible off the sensor or if they are working with a lot of VFX shots; but ProRes Log C is far more common. DIT Charlie Anderson (The Marvelous Mrs. Maisel, Netflix’s The Good Cop, HBO’s Vinyl) gave us some insight from the production side. “99% of TV shoots ProRes for the sake of speed and processing. ArriRaw is a beast in terms of data and is is mostly used in commercials or films. Nothing will stress you out more than shooting multiple cameras at 48fps in ArriRaw and having to download, sync, and transcode all that footage at once, and then do a company move in the middle of all that. The increased storage and processing requirements of ArriRaw usually mean extra manpower and extra CPU horsepower. The Arri’s ProRes and ArriRaw have the exact same bit depth of 12 bits (in case you’re curious, RED cameras are 16-bit with their .R3D files). So what makes one better than the other? ProRes is a compressed codec, whereas ArriRaw is uncompressed in terms of quality. Both are fantastic capture options, but if you’re going to maximum quality for VFX or theatrical or whatever, then choose ArriRaw, you’ll have more information to play with in your DI. ArriRaw files come to us in post as .mxf files, so on a Mac you won’t be able to preview them in Finder without a third party application. However, the workflow for importing and using ArriRaw footage is identical to importing and working with ProRes. The only difference is that you have the added benefit of being able to change camera settings within the NLE. In the same place where we would toggle the embedded LUT for ProRes clips, with ArriRaw you will have control over the color space, exposure index, white balance and tint settings while remaining non-destructive to the original footage file. Simply load the original clip into the source window and click on Effect Controls. Adjusting any of these settings will change them at the source level and will affect any instance of that clip being used throughout the project. A little over a year ago, I was about 6 weeks into cutting a network series when our project file for episode one was constantly crashing. It was a big project, with several thousand pieces of media, multiple camera types and different codecs, all referencing their own proxies, so I wasn’t surprised that the project was having some trouble. Our assistant editor noticed that the project file size was sitting above 500MB, which is massive. Usually, Premiere project files are sitting around just a few megabytes, and the massive file size was contributing to the instability of our project file. Our main cameras on the show were an Alexa Mini and an Amira, and after some digging, we figured out that the embedded LUTs that were coming off of the camera were responsible for the bloating project file. Simply turning off the LUTs wouldn’t help the project file size since that information would still be held in the project. We needed to delete the LUTs entirely, and we needed to do this on every Arri clip in the project to make a real difference. We were also working extremely quickly and had 7 more episodes to cut over the coming weeks, so we needed a quick way to fix this problem in future episode projects as well. We ended up creating a preset within Premiere that removed the LUT globally across any Arri clip you drag it onto. Here’s how to do it if you find yourself in a similar situation. First navigate to all of your Arri footage in your project window. Depending on your project, this could be as easy as creating a search bin for clips containing “.mov” in the name. (excluding all R3D media for instance). Load one of the clips from your project window into the source monitor. Then in the Lumetri Color window, under Creative choose None. Then, under the panel menu in the Lumetri Color panel, click Save Preset and name it. Now highlight all those Arri clips in the search bin you made and drag your new preset onto the clips. Save your project and take a look at the project file size as it should be far smaller. If you are having those issues during the edit, this will make a significant difference in the stability of your project: faster open times as well as faster saves and autosaves. Pro Tip for Premiere users: In a recent update, Adobe added a Global FX Mute button that can be added to the program monitor toolbar. Turning this on will hide all non-essential effects to make editing much faster for your machine. There is no need to turn this feature back off before export, because Premiere will always export with all your effects on and rendered correctly. This handy feature will speed up playback, but it won’t help with the project bloat issue. If you’ve removed the embedded LUT on all your footage, you’re now looking at flat Log C. This doesn’t really bother me during editorial, but chances are your directors, producers and clients won’t love the flat look of the footage during the edit. Anything I can do to make my director or producer feel like we are closer to the final vision, the better. So in this case, if I’ve removed the embedded LUTs for a lighter load project, I will use an adjustment layer with a standard or custom LUT over all of the footage in the sequence. To do so in Premiere, go to File, New, Adjustment Layer and drag it into your sequence above your footage. With the adjustment layer selected, in the Lumetri color panel, under Basic Correction, open the dropdown for Input LUT. Select one of the ALEXA REC709 LUTs from the dropdown. Feel free to adjust other color parameters in the color panel if needed. I usually put the adjustment layer up on a track way out of sight so I don’t have to think about it and lock that track so it doesn’t get cut up or moved as I’m moving around the edit. I will use other adjustment layers throughout the edit for other things, but I’ll leave this one just for the 709 look to easily switch it on and off if needed. Keep in mind that, as you bring more items into your sequence, that adjustment layer will apply its contained effects onto anything that lives on tracks below it. If I pulled in clips from a different non-Arri camera, for instance, they would need to go above the REC709 adjustment layer in the sequence. When it comes to finishing prep, there are a couple different ways you can deliver to a colorist. If you are working with ArriRaw footage, I would recommend sending an XML of the locked cut along with a hard drive of all the full res media. This will allow the colorist to have full control over the adjustable camera settings if needed, and give them the highest possible quality of the footage you have available to work with. If you’re working with ProRes footage, you can either send an XML and a hard drive, or you can prep a flat Log C ProRes file to be graded. In the case of sending a ProRes file, if you haven’t done so already, you’ll need to remove any LUTs and color effects from each clip so the colorist has the most information possible, without working on top of your temporary effects. 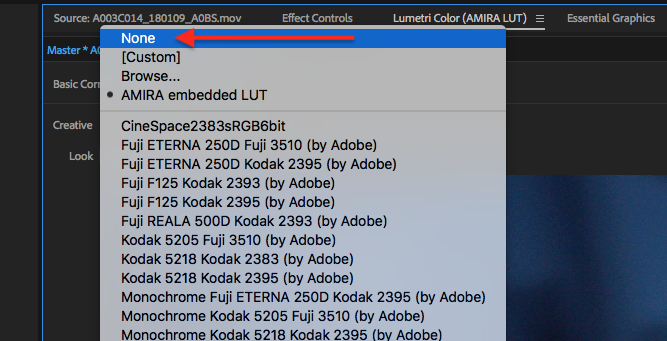 If you have color effects and LUTs living on adjustment layers, this is pretty easy to turn off; but if you’ve done any color effects on the clip level in your sequence, you’ll need to remove those effects before exporting for color. You will also need to remove any transitions like dips or dissolves from the footage so the colorist has the ability to grade the entire length of the shot through the transition. These transitions would be added back in later after the grade by either the color and finishing team or by the editor. When I export for color, I will render a Log C ProRes 4444 version of the edit. ProRes 4444 will give the colorist a lot more color information than a standard 422 HQ. And since the Alexa shoots in ProRes, this is pretty close to what was coming off the camera from the start. Recently though, I’ve started using a ProRes 4444 XQ codec for sending to color. ProRes XQ is a virtually lossless codec from Apple that they describe as the highest quality version of the ProRes 4444 and is specifically designed for VFX and color work. I started using this on a project where the colorist was having trouble bringing the noise out of a low light scene. The ProRes 4444 XQ codec will deliver data rates that are more than double the bitrate of standard 4444. It will be about double the file size as well. This codec doesn’t come standard on Apple machines and will need to be installed into your Quicktime codecs. First download the ProRes 4444 XQ cube here, and unzip the file. Then, on a Mac do a spotlight search for /Library/Quicktime and drag the component file into the Quicktime folder. Restart Premiere, and ProRes 4444 XQ will show up in your Video Codec dropdown as Quicktime codec. Like most high-end cameras today, the Alexa delivers an incredible image—yet it still remains fast, painless, and extremely simple in post-production. And that’s why I love the Alexa. Share in the comments some Alexa tips you have. I’d love to know what works for you. Thank you to Zach Prichard for contributing this article. Zach Prichard is a freelance commercial, television and film editor based out of Nashville, TN. He also serves as the senior editor at Evolve in Franklin, TN.